The menu caption is a widget which can be used as a caption above a number of menu commands in a menu. 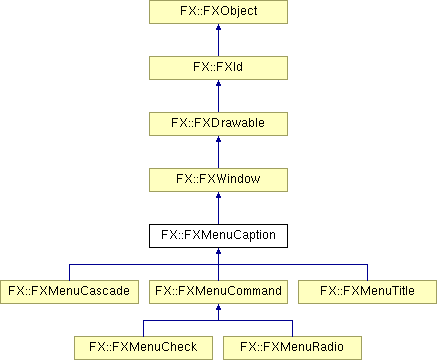 Reimplemented in FX::FXMenuCascade, and FX::FXMenuTitle. Reimplemented in FX::FXMenuCheck, FX::FXMenuCommand, FX::FXMenuRadio, and FX::FXMenuTitle. Set the text for this menu. Get the text for this menu. Set the icon for this menu. Get the icon for this menu. Return the current text color. Get the current text color. Return the selection background color. Return the selection text color. Set the status line help text for this menu. Get the status line help text for this menu. Set the tool tip message for this menu. Get the tool tip message for this menu. Save menu to a stream. Reimplemented in FX::FXMenuCascade, FX::FXMenuCheck, FX::FXMenuCommand, FX::FXMenuRadio, and FX::FXMenuTitle. Load menu from a stream.